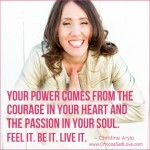 Self-Love Spark: Feeling left out or rejected? Heal your heart with this. Transmute the feelings of abandonment, rejection, and being uninvited with this video from the Divine Heart and My Heart to yours! In the past few weeks I’ve had moments when I have felt left out and it really hurt. And I saw so clearly how I had the power to either get mad and blame others and keep the hurt going OR… choose to mother those tender parts in myself, reject the story of being abandoned or excluded and look for evidence of more love. It wasn’t easy but I chose to reject rejection! You see, if you don’t transform the dark parts inside your heart that have been hurt, they just keep operating under the surface, driving you to be passive aggressive, resentful, and dark goo eeks out all over your relationships, choices and thoughts – creating the opposite of what you want, which is love. But when you pause, tap into this full moon love energy, and transmute the hurt into love, you become free and you can actually create more loving relationships and release those abandonment triggers. From a spiritual perspective, you can’t really be rejected anyway, even though that’s what it feels like at the time. Often what appears like rejection is just the Divine’s way of redirecting you to what is better for you. It’s your attachment to where that love and inclusion comes from that creates the suffering and feelings of rejection. 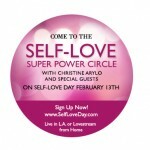 Self-Love… Ask yourself what YOU want to do and do that – you don’t need others to feel loved. Divine-love.. Ask the Divine what it wants to do with you, what it’s trying to lead you to instead that is even better for you. You have the power to reject rejection too, but you have to be willing to release the rejection story and see the divine truth. And from a human heart perspective, you still need someone to witness the hurt so you can let it go and open up the space to see Divine Love’s hand who is just trying to move you to more grace! So today, here on the self-love blog, I invite you to post up your heart hurt from feeling rejected, uninvited or left out. Just let yourself be 7 years old. Then change the story! And I will send that part of you LOTS OF LOVE! My heart hurt when some of my best friends were involved in a project that they didn’t invite me to be part of. I told myself that they were excluding me. This entry was posted in Love - Receiving & Giving, Self-Honor & Self-Respect and tagged christine arylo, feeling left out, feeling rejected, feelings hurt, rejection on November 7, 2014 by Christine Arylo. 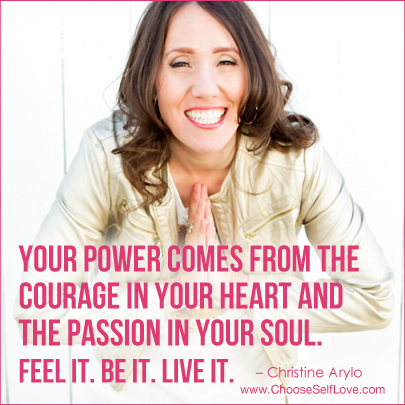 Choose Relationships that Support You to Soar … that’s self-love! A wise man once said to me, the relationships in your life can either be like wind beneath your wings supporting you to soar, or they can be like heavy weights that drag you down and keep you from flying free. I married that smart man – Noah Martin – and in the process have created not just a marriage that has supported me to do my great work and live my life’s dreams, but created an entire web of love that has allowed me to step forward past fear and uncertainty to go for my dreams full out! Now that is self-love. Today, in honor of my marriage anniversary to said wise man (that’s he and I on our wedding day nine years ago), I taped this divine spark from my heart to invite you to feel the gratitude for the love you have around you that supports you so well… and to also be honest about the ways in which you are blocking love from supporting you – through relationships that drain you or by letting fear keep your heart from reaching out and receiving the love you need to do your great work and live your great life. Think of any dream you have and the reason you aren’t living it now. Somewhere in there will be a belief about how you can’t do it because you don’t have the $ money or the time. But if you wait for when you have the extra $ or time you think you need to live your dream, you will be too old to enjoy it! When you choose to grow your LOVE WEALTH – you will create around you the support, security and resources you need to live your dream now. The only reason I could sell my house and my car, and become a spiritual gypsy, traveling around the world not knowing always where I would live or sleep was because of the massive LOVE WEALTH that surrounded me – in the form of soul family whose house I always had a place… in the form of ‘strangers’ that became new fast friends and miraculously had beautiful homes they needed watched or lived in… in the form of spiritual mentors who had done walkabouts before and lent their hand to me to help me steady in the moments I got scared… to the big hunk of man I married that helped keep me grounded and feeling safe as I slept in 20 different beds in two months this spring. Love wealth. Now I offer you the choice to expand your love wealth and let it come in to support you and your dreams to FLY! Watch the divine spark that I taped for you above and then tapping into all this love energy. 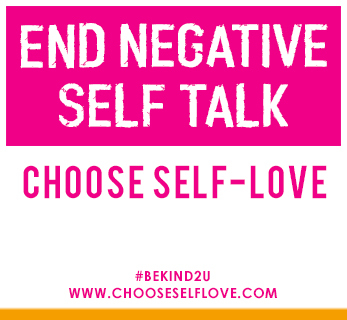 I invite you to take the following action here on the self-love blog – Noah and i will witness your stand for love together and super charge your choice to let love support your dreams. This entry was posted in Love - Receiving & Giving, Self-Honor & Self-Respect and tagged christine arylo, dream partnership, noah martin, self love on October 8, 2014 by Christine Arylo.